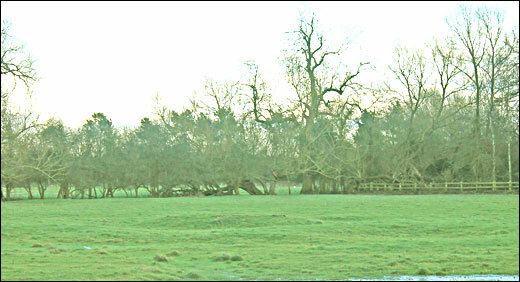 Notes: The ringed section on the right of the village plan is known locally as the 'Warrior's Mound'. Some families recall this being linked to a saint's name, but not St Vincent, as in the well. The parish covering some 700 hectares, is roughly oval and lies on a broad spur bounded by the R. Tove on the E., the Great Ousc on the S.E., and the Dogsmouth Brook on the S. W. From the wide alluvial valleys of the two rivers at about 64 m. above OD the land rises across Oolitic limestones and clays; the higher ground, above 85 m., in the central, N. and W. areas is covered by Boulder Clay. The most important archaeological remains in the parish are the Roman villa, bath house and temple (2). The modern parish is the result of both ancient and recent adjustments. 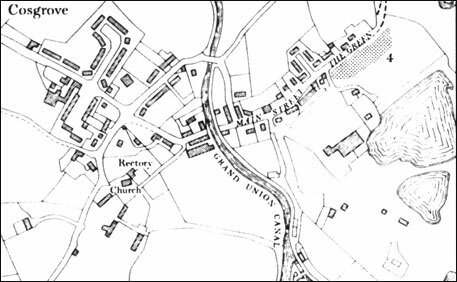 Baker (Hist, of Northants., II (1836-41), 128) wrote that 'this parish, prior to the inclosures, was inconveniently and inexplicably intermingled with Potterspury', and maps show that it included at least two detached areas now in Potterspury. In 1954 the creation of Old Stratford parish involved the transfer of the S.W. part of Cosgrove. a(1) RING DITCHES (?) (centred SP 795419), on river gravel, between 64 m. and 71 m. above OD. Air photographs (not seen by RCHM) are said to show the crop-marks of two ring ditches (SP 79564190 and 79584188), with a third 250 m. to the W. (OS Record Cards). From the description it is possible that these are the ploughed out remains of a wartime anti-aircraft emplacement (see also Old Stratford, p. 108). a(6) BURIALS (SP 781427), W. of Rectory Farm, on glacial gravel at 85 m. above OD). Several skeletons were found in a gravel-pit in about 1893-4 (OS Record Cards).